One lucky reader will win a Sleepypod Clickit Sport Harness (choice of size & color). Budget Earth & bloggers are NOT responsible for prize fulfillment. With the Holiday season in full swing, many of us are making sure our festivities are all planned out and ready to go. Tree up and decorated? Check! Mistletoe hung? Double check! Goodies baked and dinner planned? Yep! There's no doubt that this is the busiest, yet most joyful time of year. There's nothing like celebrating the magic of the Holiday season with family and friends. Speaking of family, have you planned anything special for your furry family members to include them in your Holiday celebrations? After all, they're valued members of the family, and they deserve the best of the best, too. In our case, we choose to give our pets the best of the best. Blue Buffalo™ foods and treats, available at our local PetSmart store, offer a protein rich line up that gives both dogs and cats the flavors they not only crave, but also bring out the natural, primal instincts in your pets. Blue Buffalo™ offers a wide range of food and treats for both cats and dogs that are nutrient rich, grain-free, and perfectly formulated to help them thrive. 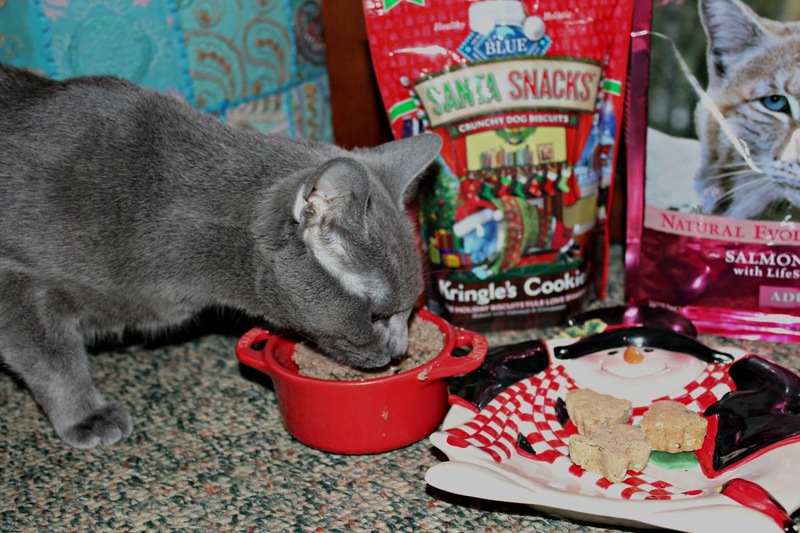 We plan to spoil our feline friends with their very own BLUE Christmas feast. My kitties love BLUE Wilderness wet foods, particularly the High Protein, Grain Free Salmon Recipe wet food. Whenever we head to our local PetSmart store, I make sure to pick up several cans so there's enough to go around. Inspired by the diet of wolves for dogs and the wild lynx for cats, true omnivores whose endurance is legendary, BLUE Wilderness is a protein-rich, grain-free food that contains more of the delicious meat your pets love. This line of food is ideal for active pets and pet parents who want a high concentration of meat with no grains. They also love BLUE's Wilderness Natural Evolution dry cat food in Salmon. This is also grain free, and gives my kitties the seafood flavor they crave and the nutrients they need to stay happy and healthy. Moral of the story? Choose the salmon. Your cats will thank you! We also love BLUE's Life Protection Formula offerings. 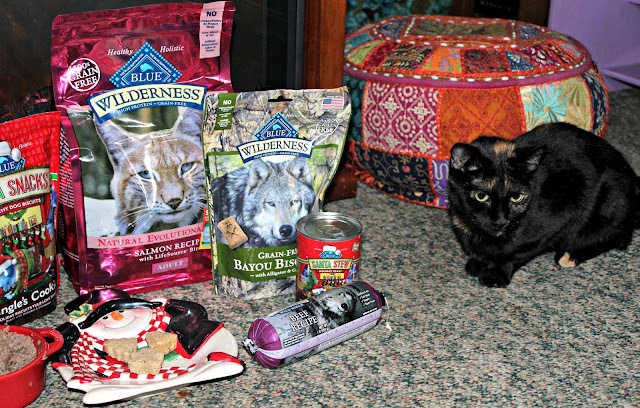 They're not pictured here, but are certainly worth mentioning if the Wilderness line doesn't suit your pets' needs. BLUE Life Protection Formula always features real chicken, fish, or lamb. They use whole grains, garden veggies and fruits and LifeSource Bits®, a precise blend of nutrients that have now been enhanced with Super 7 package of antioxidant-rich ingredients. Importantly, BLUE Life Protection Formula contains no chicken (or poultry) by-product meals, no corn, wheat or soy and nothing artificial and is formulated for all breed sizes and life stages. 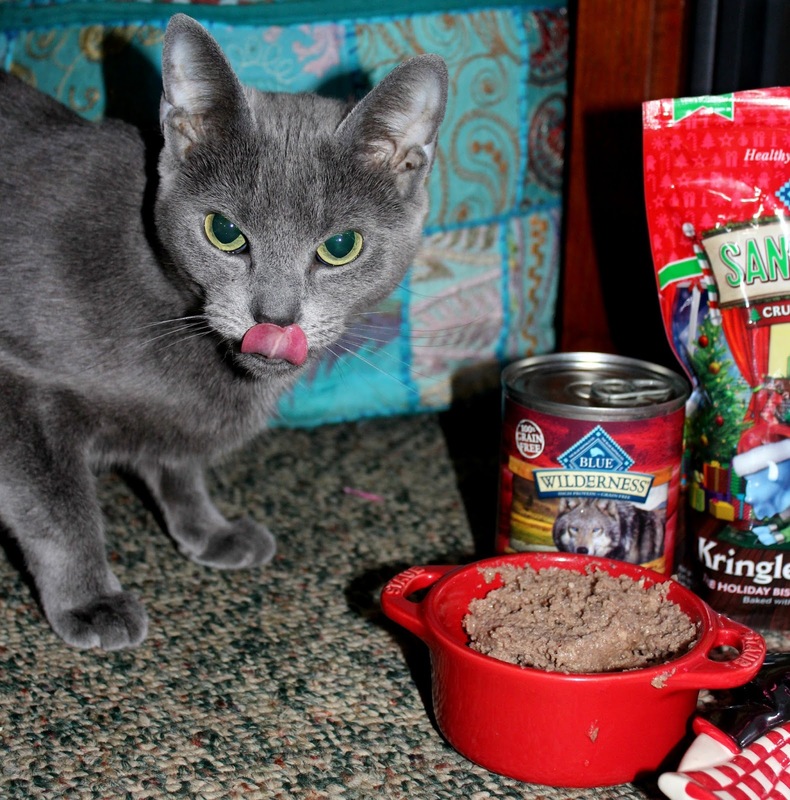 The kitties aren't the only ones getting a special Christmas feast this year! We also got some special BLUE goodies for our pup! She needs loving, too, and it will help keep her away from the cat food. 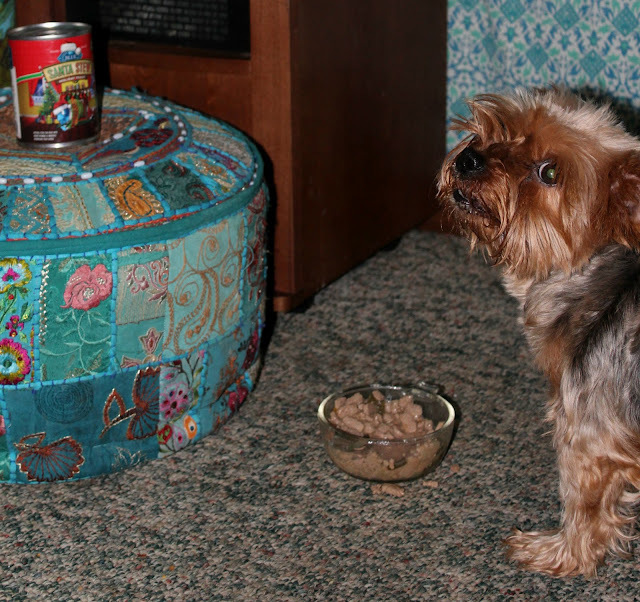 Yes, my dog tries to eat cat food. In fact, sometimes I'm convinced she thinks she IS a cat. She is outnumbered by them, 6 to 1. The struggle is real. We treated our Yorkie, Trouble, to some of the seasonal, Holiday inspired Santa Stew first. This Stew looked...Well...Like actual Stew. There was a lot of meat, as well as some veggies like beans. This stew is mouthwateringly delish, according to my spoiled rotten pup, and definitely worthy of a special occasion! BLUE also offers some great seasonal dog treats, such as the limited edition Santa Snacks. They come in a festive package, and are even in fun holiday shapes like Christmas trees! Trouble loves the taste and happily devours them, and I love the fact that these treats are grain and gluten-free, which make them a wonderful source of protein and easy for my dog to digest. If the Holiday offerings from BLUE Buffalo don't sound amazing enough, we also picked up a variety of BLUE's Wilderness canned dog food and a Wilderness Beef Recipe roll. One of the things that impresses me, and my pup, the most about BLUE Buffalo is the variety of flavors available. Of course there are several savory beef options, but there's also duck, chicken, salmon, venison, and halibut, just to name a few. Whether your pup prefers wet food or kibble. BLUE has quite the menu available that's sure to please even the pickiest of pooches. And we couldn't resist the quite intriguing sounding Wilderness Bayou Biscuits, which include Alligator and Catfish. These Cajun inspired dog treats sound like something straight from the Louisiana Bayou, and they definitely bring a taste of the exotic to my pup. She loves these! 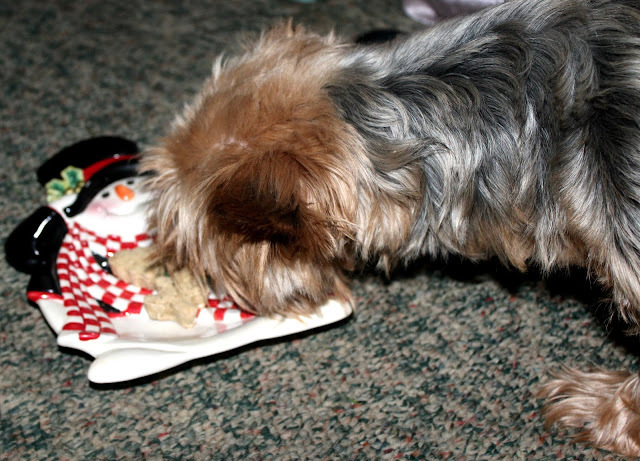 So this Holiday season, don't feed your pets "People Food" to include them in your feast. Sure, it's tempting, but human food isn't ideal for pets. Instead, check out the grain-free, high protein foods and treats and give them their own Holiday feat fit for furry royalty! 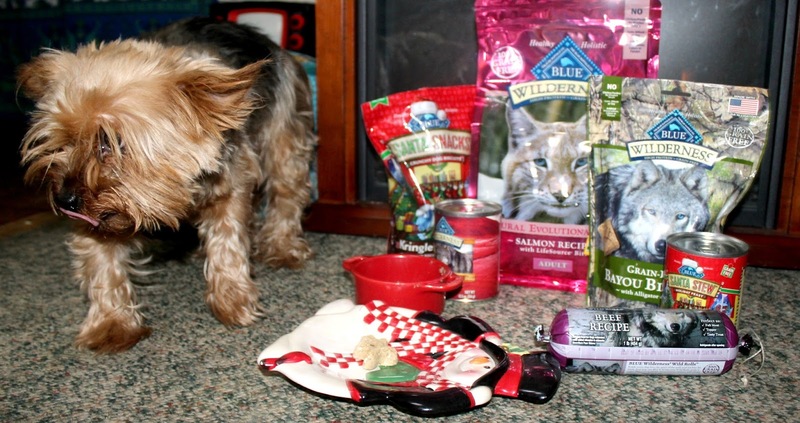 Visit PetSmart to check out the extensive line of Blue Buffalo products for your cats and dogs. Not sure which product is right for you? Every weekend BLUE sends their Pet Detectives to your local store to help you make the best decision for your family. Be sure to pick up BLUE Buffalo's Limited Edition Santa Stew Dog Food and Santa Snacks while you're at PetSmart! They're only available during the Holiday season, and are sure to please your pup. 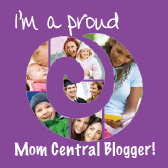 You can check out the awesomeness that BLUE Buffalo has to offer on their website. You can also connect with BLUE Buffalo on Facebook, on Instagram, and on twitter. Also, be sure to visit PetSmart to check out all of the great BLUE Buffalo varieties they carry. You can also connect with PetSmart on Facebook, on twitter, and on Instagram to stay on top of their latest news, products, and promotions. Do I have any friends out there who plan to focus on clean, healthy eating this coming New Year? Maybe you're interested in learning more about the Paleo Diet (Certified Paleo), the Zone Diet, or the Mediterranean Diet? I know I sure plan to get back on track this coming year, since this Holiday season has definitely caused me to stray away from my ideal diet on more than one occasion. I simply couldn't resist all of the delicious, seasonal treats. My 6 year old, Sophie, is one special little lady. She's fierce, she's passionate, and she's kind. She is the type of gal that laughs at limits, and will go out of her way to fight against any injustice she sees. In fact, her goal in life, other than becoming a rock star, is to help end discrimination in any form and protect our environment. Yep. I'm raising a good little activist! She even helped her Mommy with volunteering for a couple of Presidential campaigns this year. She proudly cheered, waved signs, and even got featured in a local news story, holding a sign that, coincidentally reads "Girl Power." You can check it out HERE. Her absolutely powerful picture is in the photo slideshow at the top of the article. Sophie is all about Girl Power, so she was absolutely thrilled to gave discovered SpacePOP. SpacePOP is an animated YouTube entertainment series focusing on girl empowerment, friendship and adventure. The show includes five teenage princesses who disguise themselves as musicians and form a band while they secretly plot to a rebellion against the evil Empress Geela. Serialized episodes, each about 3 minutes long and featuring a 90-second music video, are release twice per week. New episodes are getting an amazing 250K and 300K new views. You can check out these episodes on the SpacePOP YouTube Channel. Today, I want to talk about something that's sure to delight any Peppa Pig fans out there! With Christmas right around the corner, we're gearing up for some oinktastic fun here in NE Ohio. On Christmas morning, my kids are in for a huge surprise.....They will be opening up some absolutely fantastic Peppa Pig presents! We recently received an awesome package loaded with Peppa Pig fun. 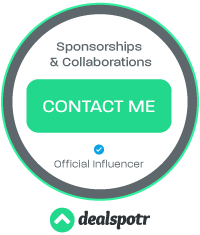 I'd love to share these products with you! Today, my kids, Sophie and Xander, want to share their favorite toys this Holiday season. They thought long and hard, and came up with their top 5 most loved gift ideas. Included are some fun new toys like the coveted Wet Head game, 3D pens, and more! Without further ado, here are the kids' top Holiday picks. With the Holiday season upon us, many of us are scrambling to find the perfect gifts and stocking stuffers. Rather than rely on processed candies, why not give a healthier, yet still delicious, brand of treats a try! Recently, I was sent a fabulous assortment of PRI products that will help me celebrate the Holiday season, with a special, New Zealand flair. There make the perfect, healthy stocking stuffers! Give the Gift of Health— December is a festive month to exchange gifts and to enjoy family and friends. Give the Gift of Health with Microlingual® tablets from Superior Source—they make great stocking stuffers! Now it’s FUN to take vitamins with NO PILLS to SWALLOW! With over 180 vitamins, there are vitamins for everyone, young old and every need. that works fast, and are quickly absorbed into the body, dissolving in seconds. Did you know that...by swallowing supplements, as much as 50% of the potency is lost in the high acid environment of the stomach. Today, I want to talk about something that's sure to delight the gamers out there, young and old! I have to admit, my entire family is basically obsessed with gaming. The hubby likes the more grown-up, "man games". My kids, however, are absolutely addicted to their Nintendo games. We have an original Wii, and several games for it, and the kiddos all have Nintendo 3DS XLs. So I think it's safe to say, we're definitely a family of gamers here.